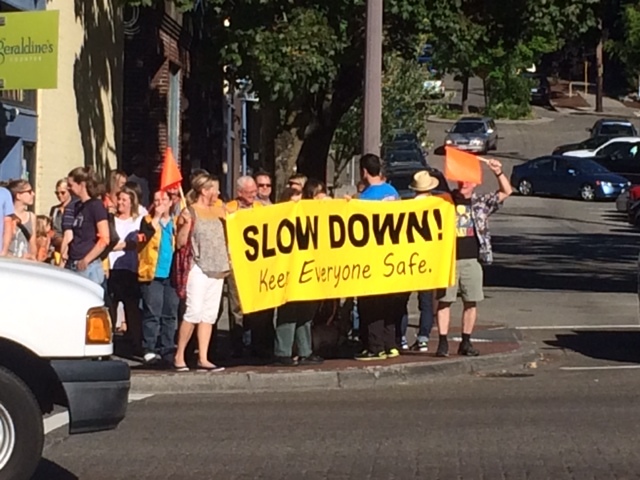 Residents and business owners in Columbia City rallied Friday to call attention to safety improvements they say are needed along Rainier Avenue. They say cars too often go much faster than the 30 mph speed limit and that signals are timed poorly, allowing pedestrians too little time to cross the street safely. “It’s a speedway right through our main street,” said hotel owner Shelley Morrison. She organized the rally at Rainier Avenue and South Ferdinand, the same intersection where a driver plowed into a hair salon and deli last week, injuring seven people. Rally organizers want a slower speed limit, better timed lights, and speed cameras. They plan to bring up their concerns again at a Sept. 17 community meeting with the Seattle Department of Transportation. SDOT city traffic engineer Dongho Chang said the timing of traffic signals will be adjusted by the end of the year, and that two radar-warning signs will be installed to tell drivers how fast they’re going. Seattle police said Friday the driver was unconscious, with her hands off the steering wheel, at the time of the crash. She was initially cited for negligent driving but the case remains under review. It is unclear if she fell asleep or had a medical problem. Clearly, this street is just chock full of irresponsible drivers. Which is WHY, Engineer Chang, WE ARE COMING TO THE CITY FOR SOME HELP. You do NOT get to duck out of it, by saying “crashes aren’t SDOT’s fault,” when there is crash after crash after crash on the same stretch of street. There’s a serious road design problem here. You are now put on notice about it. Action is required. Excuses are no longer currency here.